Nifty Ten Fifty: What is the Nifty Ten Fifty? What is the Nifty Ten Fifty? 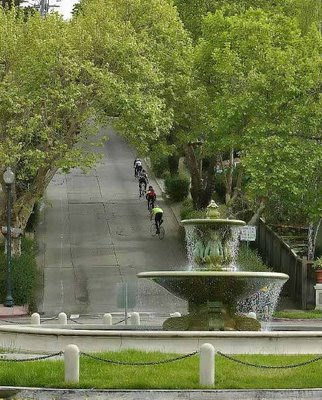 It's a bicycle ride in the San Francisco East Bay Hills that climbs 10,050' in just 54 miles visiting the steepest and most difficult climbs in the East Bay Hills. Berkeley Hills Death Ride and the Vicious Hills Ride, also play a role in the history of this event which takes place on the first Sunday in April each year. There will be two groups, an "A" group and a "B" group. "A" group will consist of riders capable of climbing Mt. Diablo in around hour or so, give or take a couple of minutes. The B group will consist of riders who might climb Mt. Diablo in about 1:05-1:25 or so. You will need good fitness to complete this ride, and unless you are an extremely strong climber a 39/27 low gear is recommended as a minimum! There are grades of up to 28%. And, for those who want to be involved in the fun but do not find 10,000' in 50 miles appealing, there is the "Nifty Lite." The Nifty Lite is not a set course but rather an easier ride, led by Janet, that covers some of the less intimidating climbs, and some terrain that is not included in the Nifty route. The Nifty Lite is the easiest option and will be custom tailored to the group that shows up. There is a detailed route sheet so that anyone can do the ride on their own, at their own pace, but with about 100 turns, it's better to follow someone who knows the way lest you spend all your time cursing the route sheet. The ride starts from Cerrito Vista Park in El Cerrito. on the first Sunday in April. "B" and "Nifty Lite" group starts at 8:30 A.M. "A" group starts at 9:00 A.M. The Nifty Ten Fifty is dedicated to the memory of Bill Ripke. Very bummed that I can't make it this year (work =P). Do you have a route map or printed route sheet I could have so that I may attempt this on my own? Who should I contact? Thanks! Nice work on the tandem. And even a smiling stoker! Tom and Cindy Long did the entire Nifty course in one of the early events, and posted a solid overall time. They're the only tandem that has ever showed for the event.